On a tiny little island in the middle of the Pacific is one of the most thrilling and adventurous things I’ve ever done…and one of the best! We had been on the island of Lanai for several days when we decided to venture away from the beach and pools and sunshine. We were renting Jeeps and off-roading through the hills and backcountry on the island. I was traveling with my family and my cousin’s family. There were 12 of us, so we would need three Jeeps. In an effort to spread out the “adventurous” from the “not-so-adventurous” people, we put our names into a hat and drew randomly. We had a good mix. We packed up sandwiches in tiny plastic sandwich bags, and apples, and bottles of water all in a Styrofoam cooler before we loaded into the Jeeps. The locals told us that it “didn’t matter what age, anyone could drive.” So we piled in, two in the front and two in the back of each Jeep. We took off down a road that soon turned to dirt, my mom, my aunt, and my uncle each driving one of the Jeeps. The dirt was initially a very light brown, like the color of sand, and incredibly soft. But just minutes later, it turned to very reddish brown color. I’ve never seen dirt this bright red before. And it was everywhere. It was dry, and clung to the air as our tires stirred it up. The passengers in the second and third Jeeps were covered in a layer of dirt within a matter of minutes. We turned the corner (I was a passenger in my mom’s Jeep) and saw a large hole in the ground, like a small canyon, with a large, large tree root sticking up through it. My aunt was leading the way and we all wondered how she was going to get around the hole. But she just looked back, smiled suspiciously, and said, “Hang on!” Red dust flew through the air, hitting our faces and oxygen supply like a room filled with tear gas, and off in the distance we could see the Jeep bouncing and rocking sideways over the canyon! Screams and laughter filled the air. We had no choice but to keep up with the leader of our pack…and so we hit the gas and flew through the air, leaping over the canyon, feeling our seatbelts tighten around our waists as we rose above our seats for a few brief seconds until we crashed back into our seats. It was impossible to not laugh. And so we did. All of us. We laughed so hard our stomachs hurt. We couldn’t get enough of the natural adrenaline rush we experienced with every hill, every cavern, every patch of rocky terrain that we plowed through. We took turns driving, our 45-year-old parents, our 22-year-old cousins, and our 14-year-old siblings. We all took a shot behind the wheel of the machine that would bring us our next bout of adventure through a narrow path of dirt surrounded tightly by tall, tall trees. We found a flat area of land away from the mountains that was covered with large rocks, all strategically placed, like a maze. We stopped here for a while and took in the scenery. 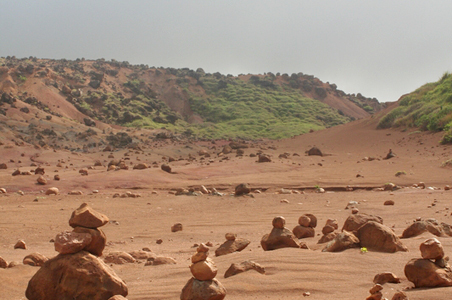 I still do not know why there were so many rocks just silently sitting along the beach in Lanai. We had lunch around here, carefully taking our plastic sandwich bags and turning them inside out over our hands. We were covered in dirt and this was our only way of not coating our insides the same way that our skin was. And as there were no restrooms or buildings, we took turns crouching behind the various rocks and “relieving” ourselves. It was our only choice. Our next find was a very secluded beach. The most beautiful beach I’ve ever seen. The water crashed against the untouched sand and we spent an hour running back and forth in the crashing waves, chasing each other and taking pictures. I wondered why there were no other people on this beach. It was so magnificent that I just couldn’t figure out why we were the only creatures visiting it. I assumed that it was just difficult to get to. After all, we did just spend hours on the most unique terrain to get here. A few weeks later, I read an article about the most dangerous beaches in the world. This beach was in the top ten. I guess it’s true…ignorance is bliss, and bliss is what we enjoyed that afternoon on a beach known for it’s overly dangerous sea turtles. The sun was setting as drove back. We were exhausted and refreshed all at the same time. As we took turns showering that night, we laughed about the red water that flowed from our skin and filled the tile floor of the shower. It took us each a good 30 minutes to remove the layer of red grime from our skin. Days later, I was still finding red in my nose and ears. Of all the things I’ve done, this is one my favorite. 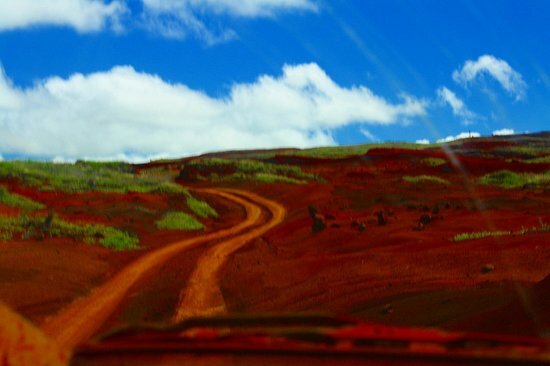 If you ever get to visit Hawaii, rent the Jeep and experience the red dirt. You won’t regret it! I’m with you Renee! Of all the things I’ve done in life, this was truly the most fun!!! What an awesome day that was! 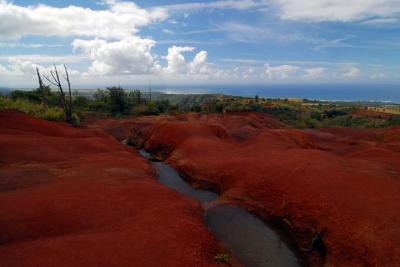 Reading your account brought on feelings of homesickness for Lanai! Both hotels are closed right now as the island goes through major renovation under Ellison’s ownership. Let’s hope the island does not lose its special character as he puts his imprint on the beautiful island! Glad you enjpyed Hawaii and the red dirt. At least I have been to Hawaii before, so I understand that you loved it.